I spent four-ish days at the GenCon Writer’s Symposium last week trying to soak up as much advice from more successful writers as I possibly could. I plucked up my courage and introduced myself to Monica Valentinelli, who was about as lovely as a person can be to a random twitter fan pestering her in the dealer room. 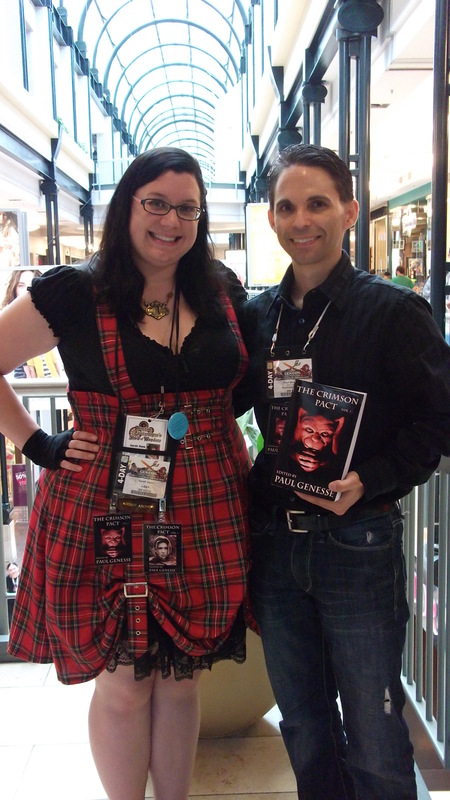 My work was critiqued by Marc Tassin, Kelly Swails, Wes Nicholson, and other accomplished authors. I finally got to meet Paul Genesse, the editor of The Crimson Pact, in person. My mentor Steve Saus introduced me to John Helfers, Maurice Broaddus, and so many others I can’t even keep them all straight. And I sat through about twenty seminars, taking notes and asking questions and generally trying to be a human sponge. Something I learned about novels: Most first novels are never published, and many novelists have trunk novels stashed away that will never see the light of day. I’ve been waiting to write a novel until I’m “ready”, but the fact is that I have the luxury of time right now because I have a day job, and I shouldn’t waste that luxury. I can invest the time in writing a novel, knowing full well that my first one will probably never be published, without having to worry about lost income; I can just enjoy the writing, and learn about the process, and figure out what my novel-writing style is. I want very much to work on collaborative projects or shared worlds, but chances are slim that anyone will be willing to take a chance on an unproven commodity. I need to have a novel under my belt before anyone will take me seriously…so that’s now on my ever-expanding to-do list. Honestly I’ve wanted to write a novel since I was a teenager, but it never seemed like the right time. Well, that time is now. So look for posts about that in the near future. If you’re an aspiring writer, or even a published one, like me, the Writer’s Symposium can be hugely beneficial for you. I recommend that everyone go next year. I’ll see you all there! Hopefully I’ll be a panelist by then, but if I’m not, I’ll be there sitting in the front row taking copious notes.